If you waited hours in line for the 12:01 premiere showing of Harry Potter and the Deathly Hallows this past Thursday evening, then you must be an avid Harry Potter fan. 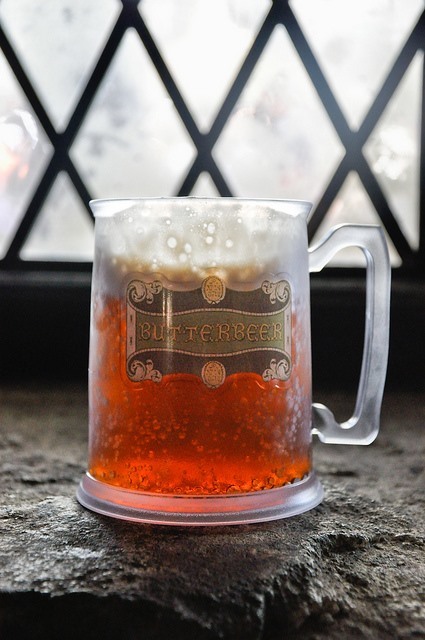 What better way to celebrate the recent release than a sampling of the legendary Butterbeer? Luckily, Darla over at Bakingdom went right to the source. Darla made a trip to the Wizarding World of Harry Potter, sampled the J.K. Rowling approved Butterbeer, and came up with this simple imitation you can make at home. Click through for the full recipe. That is an incredibly un-healthy beverage. The blog author includes instructions for a healthier, sugar-free version in the comments section, so you could check that out. You could make this not so insanely rich tho. Use Diet cream soda, leave out the sugar, and maybe use reddiwhip instead of heavy cream. It may not be exactly as foamy as the original but just as good I'd say. I'm not a big sugar fan and don't drink sugar pop so diet would be fine. @lynsey they should serve your version at the theaters this weekend!!! To Amie Coue Arbuckle: Thanks! That would be awesome. :-) Sigh. I'm going to be seeing that movie soon hopefully.